We have information you must know before you buy the Passport. 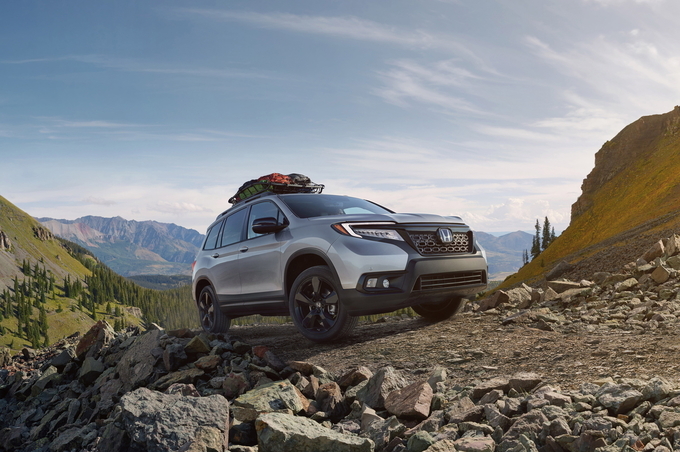 The 2019 Passport, which is essentially a shortened Honda Pilot, is on sale and arriving at dealers nationwide. Expect limited inventory and high prices, for now. Interestingly, the Passport is smaller than the Pilot but has a higher MSRP. At $33,035, the Passport Sport is $540 more expensive than a Pilot LX. The reason for this is that the Sport is a bit better equipped with 20-inch wheels, LED lights, rear privacy glass and more. Like the Pilot, Honda Sensing is standard on all trims. There are no promotional offers on the Passport, but this could change when Honda releases its new incentives after April 30, 2019. Honda may also release more offers for the Memorial Day holiday. There are no cash incentives on the 2019 Passport. Unlike other Hondas, there are no unadvertised dealer cash incentives to help drive down the price. Honda does offer a $500 bonus for recent college grads and members of the military. However, you'll have to take out a loan or lease through Honda Financial. Honda doesn't have any APR deals yet on the 2019 Passport. We think there's a good chance the brand will introduce 2.9 percent APR for 60 months, the typical rate we see on most of its new vehicles. The 2019 Passport has no advertised lease specials. That will probably change within the next few months, so check back for updates. It remains to be seen whether or not prices will be less attractive than the vehicle's big brother. For reference, the Pilot is eligible for $1,600 in factory lease cash. The 2019 Pilot LX is listed at $299 for 36 months with $2,999 at signing, an effective cost of $382 per month. For the money, we consider that a good deal relative to its MSRP. 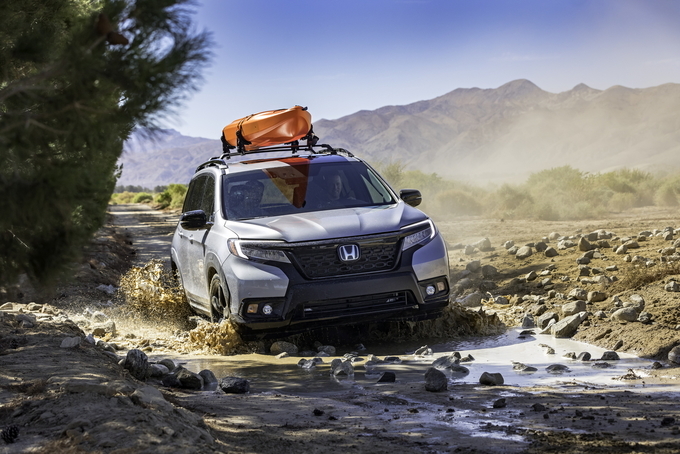 The 2019 Honda Passport is the latest SUV from the Japanese automaker, neatly fitting into the lineup between the CR-V and the larger Pilot. It's also aimed at the more adventurous crowd, sporting standard all-wheel drive and a 3.5-liter V6 engine. While it may not be able to climb rocks like a Jeep Wrangler, the Passport's adventurous edge will likely prove appealing to the scores of people drawn to vehicles like the Subaru Forester and Toyota 4Runner. The Honda Passport is a brand-new vehicle. 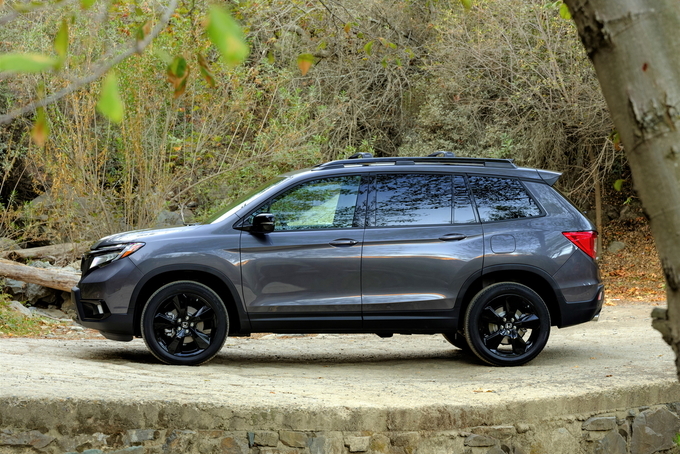 All Honda Passports come with the same engine and transmission: a 3.5-liter V6 with 280 horsepower and 262 pound-feet of torque mated to a nine-speed automatic transmission. This gives the Passport plenty of grunt for acceleration – making passing a breeze – and allows it to tow up to 3,500 pounds with front-wheel drive or up to 5,000 pounds with all-wheel drive. Honda’s choice to use a V6 over a turbocharged four-cylinder does have some trade-off, though. The Passport only achieves an EPA-estimated 20 miles per gallon city, 25 mpg highway, and 22 combined, or 19/24/21 mpg (city/highway/combined) with AWD. While smaller engines with less power generally get higher ratings, the Passport’s variable cylinder management program will shut down half of its cylinders when cruising to boost fuel efficiency. All-wheel drive is available on all trim levels for $1,900, except for the top Elite trim that has it standard. The AWD system uses intelligent torque vectoring with traction management that can be set to specific snow, mud, and sand modes for those particularly difficult surfaces. 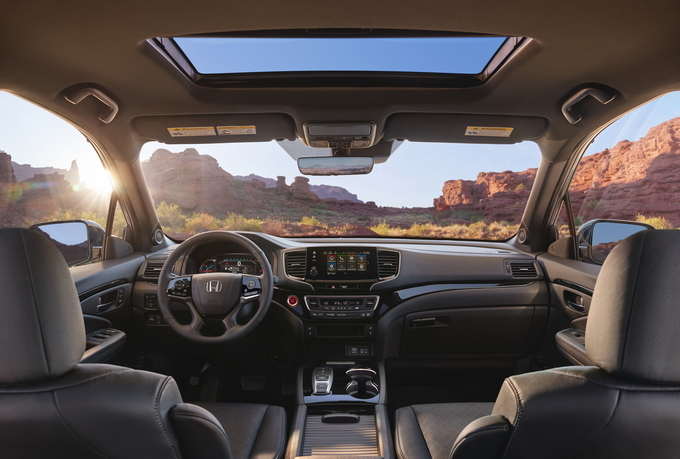 Commendably, all trims of the Passport receive Honda Sensing, a suite of advanced driver assist safety features that includes forward collision warning, automatic emergency braking, lane keeping assist, adaptive cruise control, and traffic sign recognition. In many other vehicles, these features are usually expensive options or only available as standard on the highest trim levels. The Passport sits in an interesting spot in Honda’s lineup. It isn’t exactly compact like the CR-V or HR-V, but it isn’t big enough to be family-oriented like the Pilot. 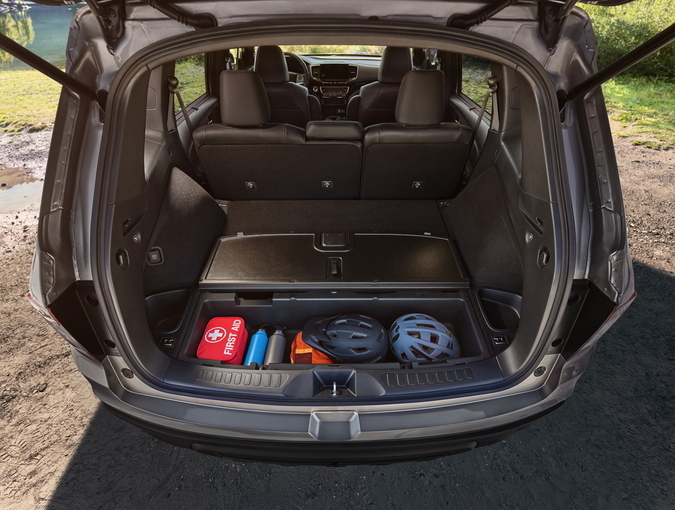 It only has two rows, but the cargo space is more than what you will find in the smaller Honda offerings, with 41 cubic feet of space behind the rear seat and almost 78 cubic feet of room when you fold the second row down. The Sport trim is the entry point for the Passport, starting at $33,035 (all prices include the $1,045 destination charge). At this price, you get black cloth seats, Honda Sensing, an under-floor cargo storage area, keyless hands-free entry with push button start, LED headlights with fog lights, and automatic high beams. Five packages are available on the Passport Sport: three Adventure Packages and two Urban Packages. 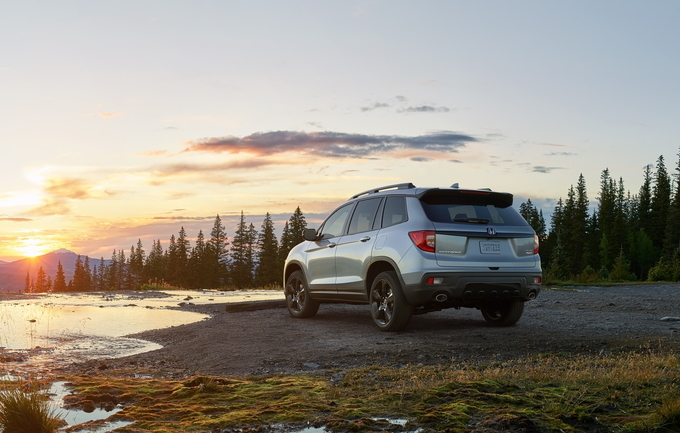 These packages range between $1,325 and $3,166 in price and include different mixes of genuine Honda dealer-installed accessories to give your Passport a more adventurous feel, whether you plan to spend time in the city or the wild. Moving up to the Passport EX-L will cost you $37,455. For this extra bit of coin, you get quite a bit more in the way of features. The EX-L gets leather-trimmed seats and steering wheel, 10-way power driver’s seat with memory, Apple CarPlay and Android Auto, a mobile hotspot, a moonroof, blind-spot monitoring, Walk Away Auto Lock, a larger 8-inch touchscreen display, a power tailgate, and integrated second row sunshades. The same five packages available on the Sport are also on the EX-L, with the same features and prices. The Touring trim starts at $40,325. The Touring gets a hands-free power tailgate, navigation, a premium audio system with 10 speakers, heated rear seats, roof rails, automatic LED headlights, a 115-volt power outlet, and extra lighting. The packages offered on the Touring are a bit different, and a new version of the Urban Package is offered, bringing the count up to six. Prices for the Adventure Packages have decreased across the board due to the standard roof rails, but the Urban Package prices have increased with the addition of some new features. The Elite trim sits on top of the Passport range with a price of $44,725. All-wheel drive is standard at this trim, as are a wireless phone charger, heated and ventilated front seats, a heated steering wheel, rain-sensing windshield wipers, and automatic dimming and power-folding side mirrors. The same packages available on the Touring remain available on the Elite. 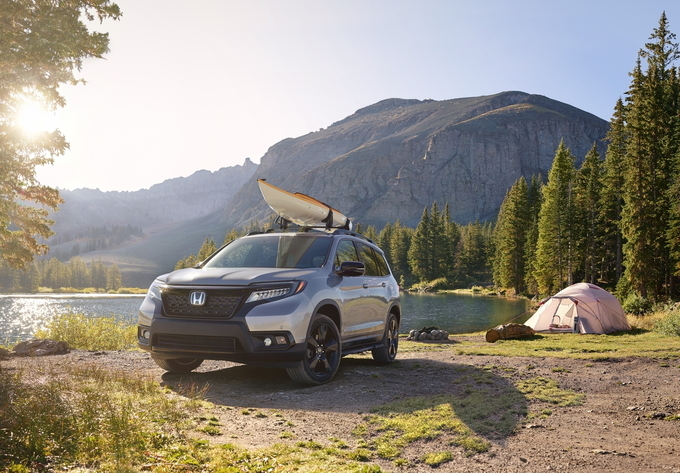 The best buy feature-wise for the 2019 Honda Passport is undoubtedly the EX-L. It feels substantially more upmarket than the Sport while maintaining a price tag of less than $38,000. We also highly recommend getting a Passport with all-wheel drive. This is a vehicle built for adventure, so get one that's capable of adventuring all over the country. All-new crossover. The 2019 Honda Passport is an all-new vehicle, but its looks and running gear are not. The Passport is essentially a sawed-off Honda Pilot, so it shares much of its looks inside and out, and most of its greasy bits with its three-row brethren. While some may chalk this up as badge engineering, there are far worse crossovers to copy from than the Pilot. Strong running gear but no off-roader. Sharing its running gear with the Honda Pilot and Honda Odyssey gives the Passport a powerful 290-horsepower, 3.5-liter V6 engine to tinker around with, giving it all the power most buyers will need. This engine pairs with a nine-speed automatic transmission that delivers slick gear changes, but it may confuse some drivers with its push-button interface. Honda bills the Passport as an off-roader, but its performance says otherwise. Sure, it has an extra 0.2 to 0.8 inches of ground clearance relative to the Pilot, but its standard front-wheel drive and lack of an available low range limit its off-road capabilities. Roomy interior, but lacking standard tech. The Honda Passport is essentially a 6-inch-shorter Pilot, but lopping off those inches doesn’t do a ton of damage to its roominess. Its rear seats are adult-friendly with 39.6 inches of leg room. This measurement falls in line with much of its class, but it exceeds the Jeep Grand Cherokee by an inch. Behind its roomy rear seat is a cargo area that hauls up to 50.5 cubic feet behind the rear seat and 100.7 cubes with the rear seats folded. This crushes every competitor, but it really lays the wood to the Chevrolet Blazer’s 30.5 cubes with the seats up and 64.2 cubes with the seats folded. On the tech side of things, the Passport comes up a light in smartphone integration. 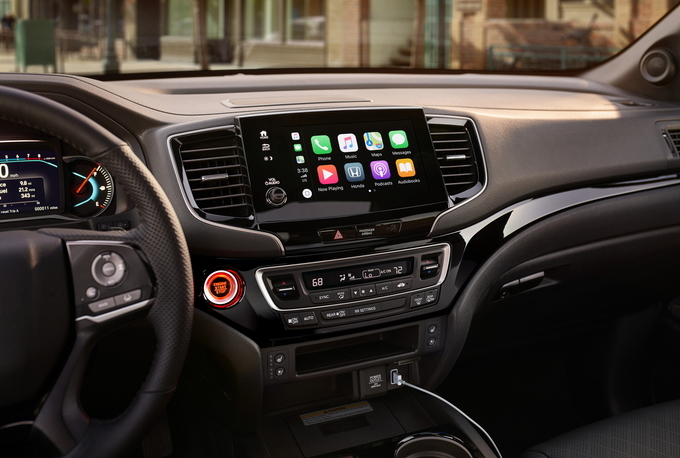 It offers useful tech like Android Auto and Apple CarPlay, but they're only available in second-in-line EX-L and higher trims. This popular feature is now standard in many models, including the Blazer, Grand Cherokee, and Hyundai Santa Fe. Loaded with safety equipment. While its competitors often make advanced safety tech optional, the Honda Passport comes standard with all the safety nannies the IIHS likes to see. These include automatic emergency braking, adaptive cruise control, automatic high-beam headlights, and lane keeping assist. Buyers looking for all the safety gadgets can opt for blind-spot monitoring. We have yet to see how the Passport performs in crash tests, but its Pilot donor is an IIHS Top Safety Pick. We expect the same results from the Passport. Final thoughts. 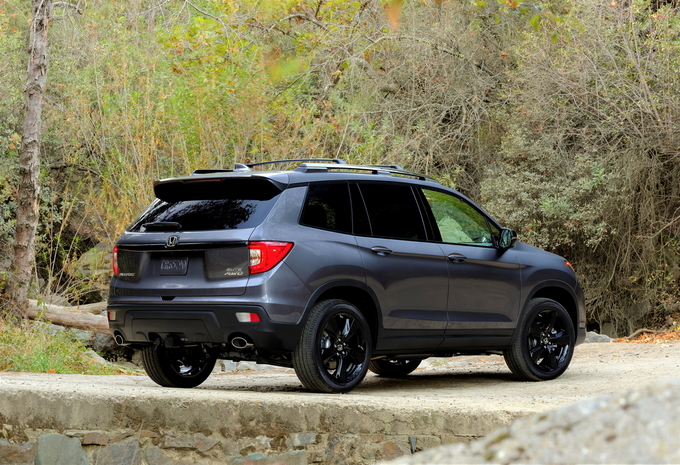 Do you love the look, feel, and ride of the Honda Pilot but don't need a three-row crossover? 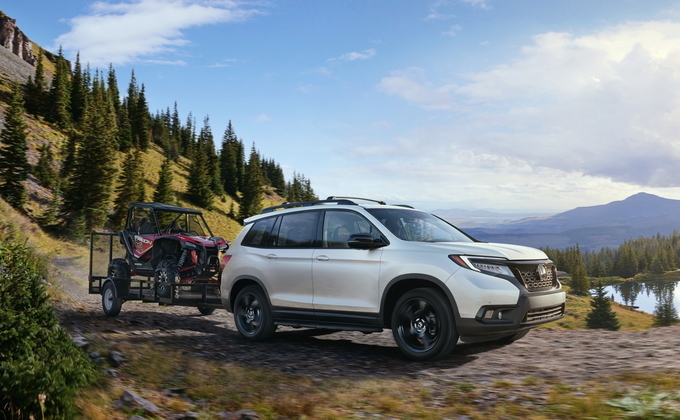 The 2019 Honda Passport is a great option to consider. It's virtually identical to the Pilot under its skin, so it delivers a similar ride quality without the added bulk of a third row. Keep in mind the Passport isn't is the off-road-ready crossover Honda markets it as. Yes, it has a higher ride height than the Pilot, but it lacks the off-road-ready goodies its rivals, including the Jeep Grand Cherokee Trailhawk, have. We have partnered with trusted dealers in your area to give you a great price on the new Honda Passport.